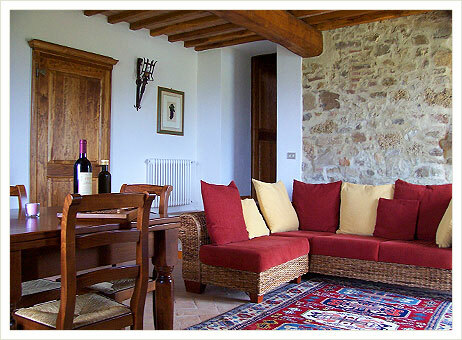 'Colombaiolo' is a farmhouse of sure quality. The vineyard and the olive grove are cultivated organically. In the farm we sell our olive oil and our wine. In the property there are three separate buildings (each one far from the others): the manor house used as holiday accommodation, a wine cellar and a little warehouse-exhibition room. 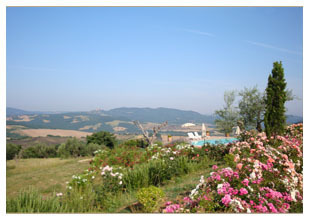 The manor house and the warehouse-exhibition room are situated on top of a hill (Tuscan poggio), with a splendid view all around and of the village of Radicondoli. The manor house has just been lovingly renovated, adhering rigorously to the original Tuscan architecture. In times past, it was built around an 11th century tower of which external barbicans and portions of the internal wall have been intentionally left still visible. 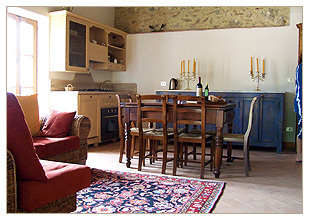 The manor house consists of four apartments, three of them are dedicated to farm holidays. 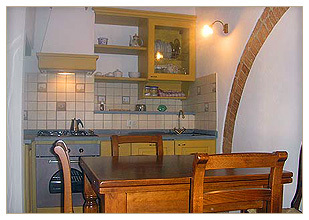 Each apartment is tastefully furnitured and according to its own peculiar structural features. The two apartments on the ground floor are with two bedrooms, each one with bathroom, and an ample drawing room / kitchen. Each apartment is for four people. The two apartments on the ground floor also have an exclusive little outdoor area, with a table and chairs. The apartment on the first floor, is in a master's style, either because of its structure or its furniture. There's a little loggia, a large drawing-room/kitchen with a Tuscan fireplace, two bedrooms and a bathroom; for four people. Each apartment has a separate entrance and there's an enchanting view from each room. All the rooms on the ground floor directly lead to the outside. The swimming pool is located on a terrace at a lower level than the house which is approximately 30 metres far, and commands a magnificent view all around. The lighting is carefully designed to allow full view of the stars at night. Between the entrance gate and the manor house there's a distance of 70 metres. They are to use as courtyard and garden, together with the space around the manor house. All the property is fenced and there's a parking area inside.